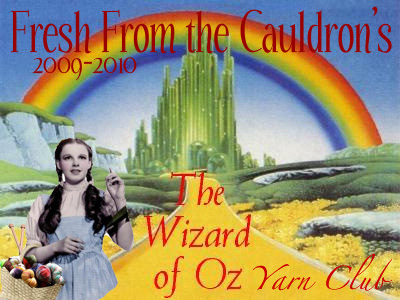 Fresh From the Cauldron's Wizard of OZ yarn club! Price includes, 2 hanks of yarn, 1 pattern, swag, and priority shipping each month. Club dates: May 2009 thru January 2010. There are 18 colorways, so 2 per month for nine months. This is a yarn club not a sock club, therefore, fiber content and yarn weights will vary. This club uses all luxury fibers; i.e. silk blends, cashmere blends, bfl, etc. I've got some of them here and I must say they are really nice! Patterns will be applicable to one, if not both, colorways per shipment. Price has been set to $75 per month. This includes 2 hanks of luxury yarn, priority shipping in the US, 1 pattern, and swag (Jen is known for fantastic swag, people). FINE PRINT: This club is limited to 15 spots and 9 are already filled. Hurry! If you're on Ravelry go directly here to sign up.